That’s the advice Detroit attorney Matt Abel gave on Tuesday to Melanie Faison, who runs the Miles Green Acres medical cannabis caregiver center on the north-central side of the city. Faison took the message to heart. She’s going to focus on helping gather signatures to halt (at least temporarily) the upcoming dispensary permitting process the city is set to start next week. Faison’s problem is the same as scores of other dispensaries in the city: A pair of MMJ-related ordinances set to go into effect March 1 could put many of them out of business because of strict zoning restrictions. The new regulations – which reflect an attempt to bring some order to the city’s medical cannabis industry in the absence of statewide regulations – require all dispensaries to get licenses. 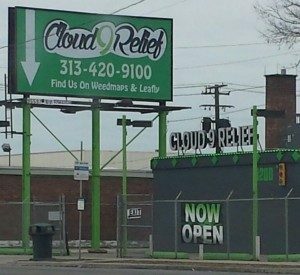 The current estimated number of dispensaries in Detroit proper, 211, could shrink to as few as 30-50 citywide as the municipality implements its new rules, said local activist Rick Thompson, who runs the Compassion Chronicles blog and is on the boards of Michigan NORML and other pro-cannabis groups. The problem is so-called “drug-free zones” that the city council adopted as part of an attempt to regulate the MMJ industry. For Detroit storefronts, that includes minimum 1,000-foot buffers from schools, churches, childcare centers, libraries, public housing projects, other dispensaries, and – this is Faison’s problem – parks. She and several other existing dispensaries nearby will be forced to close down or relocate if the new ordinances are fully implemented, as they’re right across the street from a major park. Plenty of other dispensaries are in the same boat for other zoning violations. That leaves only 651 parcels of land in all of Detroit’s 143 square miles for dispensaries to legally set up shop, according to a map compiled by the city. Contrast that with a map of some of the existing dispensaries in the city (on page 5 of the Loveland Technologies report produced last year), and it’s easy to see why many Detroit MMJ businesspeople are concerned. Tim Ratliff, the owner of another dispensary called Tribute down the street from Miles Green Acres, has the same issue as Faison, because of the same park. He estimated that he’s sunk around $400,000 into renovating and decorating his shop, the inside of which is covered in murals depicting players of the Detroit Lions, Pistons, Tigers and Red Wings, along with other parts of the city. It wasn’t cheap, and he may have to simply walk away from the entire investment. That’s why Thompson and others – including Faison and Ratliff – have been circulating petitions for a referendum to force at least a stay of execution. If the coalition can get at least 4,055 signatures of Detroit voters by Monday, they can force the city to delay implementing the ordinances and put both laws on the Aug. 2 primary election ballot for voters to weigh in on. The delay would give MMJ businesses time to get the word out that the ordinances need to be defeated, said another dispensary owner who asked to not be named. If the ordinances are allowed to stand, there’s not a lot of room left in the 651 legal areas designated by the city for MMJ storefronts, which means relocating may prove nearly impossible, the owner said. Many of those pieces of land, he said, are already being used for other businesses. Or they’re too close to, for example, liquor stores that aren’t registered with the city. But it’s not necessarily that simple, Thompson warned. Even in the worst-case scenario, however, it won’t mean the end of Detroit’s MMJ trade. Abel, for example, is sitting out the current ordinance fight because he has clients who are already located in spots where they won’t have any trouble getting their storefronts licensed. So they’re fine with the ordinances as passed by the city. All that notwithstanding, Abel also said he thinks at the worst the city may get down to about 100 storefronts, since there are zoning exceptions (called variances) that a lot of dispensaries could apply for with the city. So, he argued, it’s really difficult to tell how things may shake out for the city’s dispensaries. “Eventually, I think there could be a hundred. It depends how strict or liberally they’re going to grant variances from churches and liquor stores,” Abel said. And none of that really takes into account how the city’s – and the state’s – marijuana industry landscape could change if recreational cannabis is legalized in November as well. What it all adds up to is that 2016 is going to be a turbulent year for Michigan’s marijuana businesses. There’s no ‘polite’ way to say this: the City Council’s plan is based on lies. No one should promote the canard that marijuana is a drug. In truth it’s a medicinal herb, cultivated, bred, and evolved in service to human beings over thousands of years. I favor the MILegalize petition. Please visit its website and contribute to its campaign fund. Prohibition of marijuana is a premise built on a tissue of lies: Concern For Public Safety. Our new laws save hundreds of lives every year, on American highways alone. In November of 2011, a study at the University of Colorado found that, in the thirteen states that decriminalized marijuana between 1990 and 2009, traffic fatalities have dropped by nearly nine percent—now nearly ten percent in Michigan—more than the national average, while sales of beer went flat by five percent. No wonder Big Alcohol opposes it. Ambitious, unprincipled, profit-driven undertakers might be tempted too. and a trace of the marijuana passed at a party ten days ago. However, on the whole, as revealed in big-time, insurance-industry stats, within the broad swath of mature, experienced consumers, slower and more cautious driving shows up in significant numbers. Legalization should improve those numbers further. Marijuana has many benefits, most of which are under-reported or never mentioned in American newspapers. Research at the University of Saskatchewan indicates that, unlike alcohol, cocaine, heroin, or Nancy (“Just say, ‘No!’”) Reagan’s beloved nicotine, marijuana is a neuroprotectant that actually encourages brain-cell growth. Researchers in Spain (the Guzman study) and other countries has discovered that it also has tumor-shrinking, anti-carcinogenic properties. These were confirmed by the 30-year Tashkin population study at UCLA. Marijuana is a medicinal herb, the most benign and versatile in history. “Cannabis” in Latin, and “kanah bosm” in the old Hebrew scrolls, quite literally the Biblical Tree of Life, used by early Christians to treat everything from skin diseases to deep pain and despair. Why despair? Consider the current medical term for cannabis sativa: a “mood elevator”. . . as opposed to antidepressants, which ‘flatten out’ emotions, leaving patients numb to both depression and joy. The very name, “Christ” translates as “the anointed one”. Well then, anointed with what? It’s a fair question. And it wasn’t holy water, friends. Holy water came into wide use in the Middle Ages. In Biblical times it was used by a few tribes of Greek pagans. But Christ was neither Greek nor pagan. ‘anointed one’ could gain a spark, an insight, a sense of the divine, and the confidence to convey those feelings to friends and neighbors. I am appalled at the number of ‘Christian’ politicians, prosecutors, and police who pose on church steps or kneeling in prayer on their campaign trails, but cannot or will not face the scientific or the historical truths about cannabis, Lately we can add willfully ignorant pastors to this list. ‘1000 feet from a religious institution’? ‘WE DON”T WANT THIS SCOURGE IN OUR NEIGHBORHOODS’?? ‘Christian’ churches objecting to the Biblical Tree of Life, Medicinal Herb Number One, safe and effective for thousands of years, and celebrated as sacraments by most of the world’s major religions. The pastors are wrong. Their flocks are misled. They are not as Christian as they claim to be.